Sacred music has long contributed fundamentally to the making of Europe. The passage from origin myths to history, the sacred journeys that have mobilized pilgrims, crusaders, and colonizers, the politics and power sounded by the vox populi--all have joined in counterpoint to shape Europe's historical longue durée. Drawing upon three decades of research in European sacred music, Philip V. Bohlman calls for a reexamination of European modernity in the twenty-first century, a modernity shaped no less by canonic religious and musical practices than by the proliferation of belief systems that today more than ever respond to the diverse belief systems that engender the New Europe. In contrast to most studies of sacred musical practice in European history, with their emphasis on the musical repertories and ecclesiastical practices at the center of society, Bohlman turns our attention to individual and marginalized communities and to the collectives of believers to whose lives meaning accrues upon sounding the sacred together. In the historical chapters that open Revival and Reconciliation, Bohlman examines the genesis of modern history in the convergence and conflict that lie at the heart of the Abrahamic faiths--Judaism, Christianity, and Islam. Critical to the meaning of these religions to Europe, Bohlman argues, has been their capacity to mobilize both sacred journey and social action, which enter the everyday lives of Europeans through folk religion, pilgrimage, and politics, the subjects of the second half of his study. The closing sections then cross the threshold from history into modernity, above all that of the New Europe, with its return to religion through revival and reconciliation. Based on an extensive ethnographic engagement with the sacred landscapes and sites of conflict in twenty-first-century Europe, Bohlman calls in his final chapters for new ways of hearing the silenced voices and the full chorus of sacred music in our contemporary world. 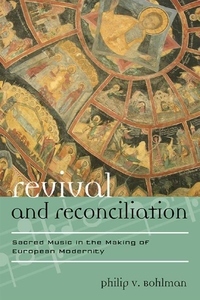 Ethnomusicologists from different traditions as well as scholars of religious studies and the history of modern Europe will find Revival and Reconciliation a fascinating exploration of the connections between sacred music and the role it plays in the formations of the modern self.